As is the case for many natural cat breeds the origin of this cat is hazy. On the basis that this is indeed a cat that has evolved naturally without mankind’s involvement until becoming a pedigree cat, the Russian Blue, as the name suggests, comes from Russia. More particularly, the town of Archangel in North Russia(see map underlined in red). The city (or is it a town) is now called Arckhangelsk. 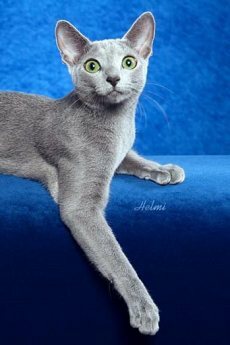 If you want to see a bigger and better map plus bigger high quality Helmi Flick pictures of the Russian Blue cat in a slide show accompanying a description of this breed with reference to a breed standard then click on the link: Russian Blue. Far from me to suggest it, but it does seem a very happy coincidence that a cat that comes from cold and icy Russia should naturally be cold and icy in appearance. Perhaps this cat breed’s appearance has been refined, by careful breeding. Amanda Bright who has been breeding Russian Blues for almost 39 years says, “the Russian Blue did originate in Arkhangelsk and was developed in England AND the USA beginning in the late 1800s and early 1890s. Early USA cats included Peterkin, Peterkin II and Fiametta — and we have pictures of these American Russian Blues. There was also a cat called Olivette who was a Bayard daughter.” Thank you Amanda. Blue cats of many kinds were imported into England from supposedly “Russia”, i.e. blue and white, solid blue, blue tabby…it was the humans who decided to work only with the solid blue…there are no natural barriers in the area of Archangelisk to keep shorthaired blue only cats separate from any other hair length or color. So, what I am saying is they are not a “natural” breed, just a common blue color that the breeders decided to make into a breed. ACFA, TICA and GCCF DO recognize the whites/blacks/tabbies for showing in provisional classes, just not for championship yet. The “colors” are accepted by, as you mentioned Australian and New Zealand registries, plus LOOF in France, South African cat registry and many smaller independent cat registries all over Europe–i.e. Neocat etc (Europe has a different system and it is hard to find out exactly which independent registries accept what breed and colors). You are correct that CFA only recognizes the Russian in the color blue. Also, those first two Russian Blues registered in the 1940’s in the CFA studbooks actually have a British Blue for a dam! There is also a question about some of the earlier “Russian blues” pedigrees, i.e. coming from Brits or alley cats, imported into the USA in the early 1900’s. 1890 Formally imported into UK? 18-10-08 A Russian Blue cat won the Best of the Best award at the CFA/Iams Championship at Madison Square Garden 19th October 2008. His name is Runner. Full name is Platina Luna Blade Runner. The proud owners/keepers are not cat breeders, just exhibitors. There names are Teresa Keiger and Rob Miller. 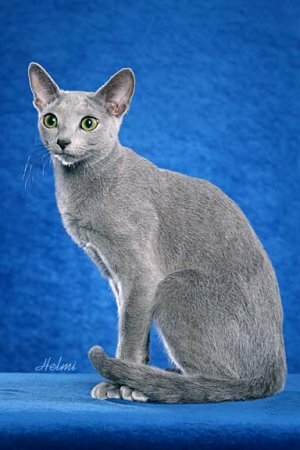 TICA and CFA have breed standards specific to the Russian Blue. 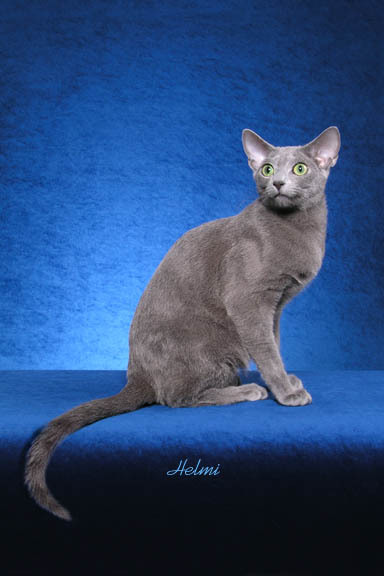 GCCF (UK) uses the Russian Blue standard for the Nebelung as apparently the only difference is the length of the hair. The GCCF does not formally recognize the Nebelung, however (see above- history as well). This breed is a nice medium sized cat (see cat size/weight comparison). The body conformation is described as “foreign” in the cat fancy, meaning slender (cat body types). Gloria Stephens says the Russian Blues she say in Russia were semi-foreign, meaning more cobby. But this is a cat of moderate body proportions. The body is long and graceful. The tail is long and the feet small and oval shaped. This is also an elegant cat with larger than average ears. 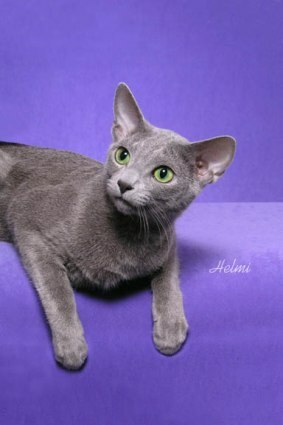 The Russian Blue Cat always has blue-grey hair and green eyes, which simplifies a description of this cat. Altough breeders are developing different colors (what a shame!). 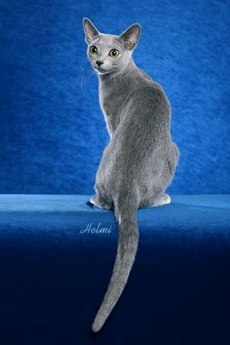 The Russian Blue is shown in the traditional category, solid division and in blue only (dilute black). You can see a bit more on dilution by clicking on this link. Helmi’s photographs say it all. Looking at the eyes of the cats (Bali, Beauty and the cat below right) it is noticeable how wide open they are. This seems to be a characteristic. They should be “vivid green” color and I think that they are. Other cats with similar color configuration are the British Shorthair (one of the colors is blue/grey),the Chartreux (exclusively grey), Nebelung (the Russian Blue has been used to add “type” to the Nebelung i.e. make the Nebelung look more like she is meant to look) and the Korat. 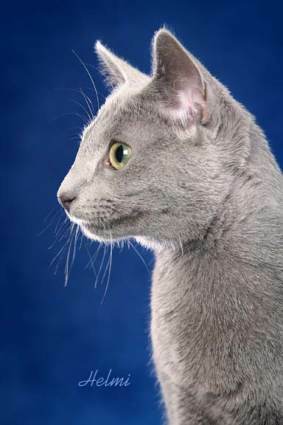 Both the Nebelung and Korat are also exclusively grey – see grey cat breeds. The coat is the outstanding feature of this cat. It is a double coat with dense fur, fine in texture and “plush”. The top coat (guard hairs) are blue with silver tipping giving the special chilly Russian appearance that you can see in Helmi’s photographs. Reports say that this is an intelligent breed of cats (although most admirers of a breed will say this) and that (s)he possesses all the usual attributes of a sociable pet. They are perhaps a little shy, it seems, with strangers (this maybe anecdotal) and are content it is said to remain indoors and watch the world go by. 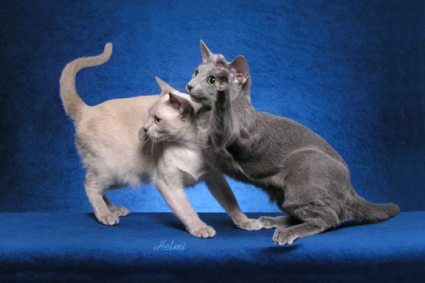 This may account for their popularity in the United States where they like to keep cats in full-time and where the Russian Blue cat is ranked 9th out of about 70 breeds polled. The European breed is apparently slightly heavier and larger than the American breed. However, the cat above right, by Sensual Shadows Photography, is an American cat and I think heavier than the show cats taken by Helmi in America. So, I’m not sure this is true, generally. See a full worldwide list of Russian Blue cat breeders taken from several sources. Click on the link to read about buying Russian Blue kittens with by some really nice pictures. Otis Russian Blues. – Located in the UK, Chesterfield, Derbyshire. Breeding this cat since 1993. Siblu Cattery – Link broken 8th July 2011. Run by Cheryl Steffe. The Cattery is located in the Lower Blue Mountains, one hour’s drive west of Sydney. This is one of the best cattery sites that I have seen. Enchanting Diety Cattery (new window) – This is based in Estonia and owned and managed by Eduard Maandi. 1. Legacy of the Cat page 137. Amanda Bright who says, “I’ve been breeding cats under the prefixes of Kyina and Talisker since 1970 and am currently a Provisional Allbreed judge with TICA. I’ve had Russian Blues for most of those 39 years and am one of the people who does the most historical research on the breed.” Thanks Amanda. I always welcome information. Map: this is courtesy www.embassyworld.com and is copyright free as I understand it. The map has been modified to make it smaller and to highlight the town of Arckhangelsk. It is made smaller for practical reasons. This entry was posted in Russian Blue and tagged cat breeds, cat facts, russian blue cat, russian blue cat photos, russian cat breeds by Michael Broad. Bookmark the permalink. I rescued a russian blue from a tree with a pit bull circling below and barking, just waiting for her to fall. 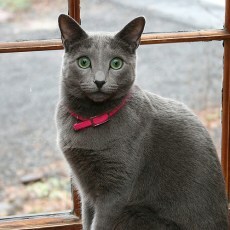 She looks exactly like a russian blue with all the personality of this particular breed. But she has yellow eyes, not blue or green. Is she pure? I don’t care if she isn’t. I love her anyway. Just wondering about her eye color. She is around one or two years old. Good teeth, very active, very loving, hears all strange noises. I have just read your first comment and see that she was rescued. Do we know the original owner and how he/she acquired her? That would help. I have responded to your other comment for which I thank you. Hoobly is another site that can have home bred cats, then you can always also look on a pure cat rescue site at PetFinders.com. I’m looking for a Russian blue kitten by Christmas can anyone help me I’m located in flora Illinois please and thank you. Good luck Cassie. Have you tried the associations and perhaps Yahoo Groups? Are you planning to buy from a breeder? I had a Camille Onrush Blue when i was a chilled growing up. Her name was bo bo. She was gentle around her family yet at the same time she was shy when visitors came over. She lived 17 years. She left a life long mark on every hart that was in the family at the time.